2) Crops bent at node points and matted in a distinct pattern. Coined by: The term was invented by researcher Colin Andrews in the early 1980s and entered the Oxford Dictionary in 1997. Crop circle is a term used for a phenomenon where crops, such as wheat, barley, rapeseed (also called "canola"), rye, corn, linseed and soy are flattened or bent low on their stalks, producing circular and other patterns when viewed from the air. Crop circles were first reported during the later decades of the twentieth century in a few crop fields, but since have become a worldwide phenomenon. Various hypotheses have been offered to explain their formation, ranging from the naturalistic, and hoaxes, to the paranormal. Most commonly, crop circles are connected to UFOs and beliefs in extraterrestrial life, with claims that they are communications from aliens. While many have been proved hoaxes, crop circles have continued to appear and both the general public and scientific researchers have continued to be fascinated by the phenomenon. Like other such mysteries, there are those who believe they originate in a realm beyond the known physical world and there are those who reject such possibilities. This clash between those who are skeptical and those who are open to the unknown reflects human desire to pursue truth and at the same time the problem of ignorance and confusion regarding how to discover and recognize truth. Crop circles did not become a widespread phenomenon garnering worldwide interest until the late twentieth century. However, there are some who claim that crop circles have been appearing for centuries, particularly in Europe. The earliest account of what has been suggested to be a crop circle may be found in a seventeenth-century English woodcut called the Mowing-Devil. The image depicts the Devil with a scythe mowing (cutting) a circular design in a field of oats. The pamphlet containing the image states that the farmer, disgusted at the wage his mower was demanding for his work, insisted that he would rather have "the devil himself" perform the task. According to the pamphlet, that night his field appeared to be in flame. The next morning, the field was found to be perfectly mowed—unnaturally perfect, in fact. 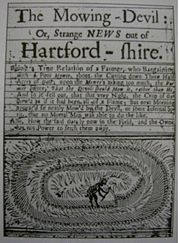 1678 pamphlet on the Mowing-Devil. The storms about this part of Surrey have been lately local and violent, and the effects produced in some instances curious. Visiting a neighbour's farm on Wednesday evening (21st), we found a field of standing wheat considerably knocked about, not as an entirety, but in patches forming, as viewed from a distance, circular spots....I could not trace locally any circumstances accounting for the peculiar forms of the patches in the field, nor indicating whether it was wind or rain, or both combined, which had caused them, beyond the general evidence everywhere of heavy rainfall. They were suggestive to me of some cyclonic wind action. In 1966, one of the most famous accounts of UFO appearances was reported in the small town of Tully, Queensland, Australia. A sugar cane farmer said he witnessed a saucer-shaped craft rise 30 or 40 feet (12 m) up from a swamp and then fly away. When he went to investigate the location where he thought the saucer had landed, he found the reeds intricately weaved in a clockwise fashion on top of the water. The woven reeds could hold the weight of 10 men. The incident gained a lot of attention first in Australia, and then later in the world, albeit short lived. It is possibly the reason that many of the subsequent instances of crop circles were linked to UFO activity. Crop circles started to appear throughout the English countryside in the 1970s, and became even more frequent in the 1980s. At first the designs were uncomplicated circles, or variants of circles, but as the frequency of the phenomena increased throughout the 1980s, so did their complexity. In Great Britain a reported 400 new crop circles were discovered in 1990, considered a peak year for the incidents. Designs discovered at Barbary Castle were some of the largest and most geometrically complex reported. The frequency and complexity of the crop circles, as well as the mystery surrounding their creation, helped to gain the attention of the media. Not long afterwards, crop circles began to show up in other countries, such as the former Soviet Union and Japan, as well as the U.S. and Canada. Like many aspects of the occult and paranormal, crop circles soon became incorporated and exploited by pop culture. An example of this is the occasional profit made from circle incidents. Although some farmers expressed concern at the damage caused to their crops, local response to the appearance of crop circles can often be enthusiastic, with locals taking advantage of the tourist potential of circles. Past responses have included bus or helicopter tours of circle sites, walking tours, t-shirts and book sales. Potential markets include curious tourists, scientists, and crop circle researchers, and individuals seeking a spiritual experience by communing with spirits. In 1996, a circle appeared near Stonehenge, and the farmer set up a booth and charged a fee. He collected £30,000 in four weeks. The value of the crop had it been harvested was probably about £150. Widespread media coverage of crop circles, coupled with the revealing of some very complex and famous circles being the products of hoaxes, dulled the widespread intrigue of crop circles. Nevertheless, many committed researchers continue to be devoted to their study. Crop Circle near Chartley Manor Farm in Staffordshire, England, August 2006. Early examples of crop circles were usually simple circular patterns of various sizes. Later, more complex geometric patterns emerged. In general, the early formations (1970–2000) seemed to be based on the principles of sacred geometry. Later formations, those occurring after 2000, appear to be based on other principles, natural sciences and mathematics designs, including fractals. Many crop circles have fine intricate detail, regular symmetry, and careful composition. Elements of three-dimensionality became more frequent, culminating in spectacular images of cube-shaped structures. A crop circle in the form of a double (six-sided) Triskelion composed of Circles. 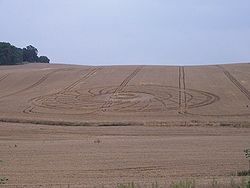 Since nearly the beginning of the crop circle phenomenon, there have been many who claimed that the designs were hoaxes. One of the most famous examples happened in 1991, when two men from Southampton, England announced that they had conceived the idea of crop circles as a prank at a pub near Winchester, Hampshire during an evening in 1976. Inspired by the 1966 Tully Saucer Nests, Doug Bower and Dave Chorley made their crop circles using planks, rope, hats, and wire as their only tools: using a four-foot-long plank attached to a rope, they easily created circles eight feet in diameter. The two men were able to make a 40-foot (12 m) circle in 15 minutes. The pair became frustrated when their work did not receive significant publicity, and so in 1981 they created a circle in Matterley Bowl, a natural amphitheatre just outside Winchester, Hampshire—an area surrounded by roads from which a clear view of the field is available to drivers passing by. Their designs were at first simple circles. When newspapers claimed that the circles could easily be explained by natural phenomena, Bower and Chorley made more complex patterns. A simple wire with a loop, hanging down from a cap—the loop positioned over one eye—could be used to focus on a landmark to aid in the creation of straight lines. Later designs of crop circles became increasingly complicated. Eventually Bower's wife became suspicious, noticing high levels of mileage in their car. Fearing that his wife suspected him of adultery, Bower confessed to her and subsequently he and Chorley informed a British national newspaper. Chorley died in 1996, but Doug Bower continued making crop circles until at least 2004. Crop Circle hoaxes and techniques became widespread knowledge by the end of the twentieth century. In 2002, Scientific American published an article by Matt Ridley, who had started making crop circles in northern England in 1991. He wrote about how easy it is to develop techniques using simple tools that can easily fool later observers. Methods to create a crop circle are now well-documented on the Internet. One internet group of crop circle makers demonstrated that making what self-appointed cereologist experts state are "unfakeable" crop circles is possible. On more than one occasion cereologists claimed that a crop circle was genuine when the people making the circle had previously been filmed making it. Not everybody accepts that crop circles are man-made, however, believing instead that many designs are too perfect and that they lack signs of human interaction. Among these critics was British born astronomer Gerald Hawkins who, prior to his death, argued that some circles displayed a level of complexity and accuracy that would be difficult to recreate on paper, let alone in a field after dark. In response, circle creating groups and proponents of the man-made hypothesis have claimed that it is possible to create a complex design by marking radii and angles with rope, and to enter and to move about a field using landscape features and tractor trails in order to avoid leaving other marks. One issue is that despite the appearance of numerous crop circles, those making them are almost never caught in the act. In most cases that the creation of crop circles is a nocturnal activity, making it difficult to observe their construction. During one attempt to observe the creation of a crop circle, numerous individuals witnessed nothing out of the ordinary, yet were astounded the next morning to see a crop circle in a field 500 yards (460 m) away from the one they had been watching all night. Since appearing in the media in the 1970s, crop circles have become the subject of various paranormal and fringe beliefs, the most popular being that they represent messages from extraterrestrials. UFOs and other lights in the sky have been reported in connection with many crop circle sites, leading to them becoming associated with UFOs and aliens. Some people claim to have seen images of UFOs forming crop circles or flying over them, though photographs have been dismissed by skeptics as being indistinct or clearly hoaxes. The gadget indicated electrical current flow in plants and living matter, including humans. However, in 'genuine' Corn Circles (as opposed to human made ones) there was a complete lack of energy almost as if whatever was making the corn circles had 'earthed' them. Suddenly, we all heard a sound from the east. As we listened, it grew louder and we could sense it getting closer. It was definitely directional, in that we could all tell precisely where it was coming from, and we could follow it as it moved. The sound then rotated around us, floating around the circle three or four times, like an auditory cloud that passed above us in a circle. And again, it was directional: As it moved in its orbit around us, we could follow it with our ears, and if it had been visible, we all felt we would have been able to track it from point to point around the circle. First it was in our left ear, then behind us, then in our right ear. ... In the exact direction the sound seemed to travel to when it left us was a fresh crop ring. The plants were still popping up, and still moving, as though a powerful hand had pressed them down, and they were just now springing back up. ... I believed then, as I believe now, that we had inadvertently encroached upon the creation of a crop circle. We had all unwittingly placed ourselves in the middle of a paranormal event. Most often, circumstantial evidence is used as justification for the UFO theory: The designs are created at night, usually without eyewitnesses; the designs at times are large, geometrical shapes and designs that may (or may not) have mathematical significance; and most importantly, crop circles are best seen from above the ground, such as in an airplane, implying that an airborne device was used to create it. Others see crop circles as a more spiritual matter. The location of many crop circles near ancient sites such as Stonehenge, barrows, and chalk horses has led to many New Age belief-systems incorporating crop circles. This includes the belief that they are formed in relation to ley lines and that they give off energy that can be detected through dowsing. New Age followers sometimes gather at crop circle sites in order to meditate, or because they believe that they can use the circle in order to contact spirits. A third possibility that has been set forth is that crop circles are caused by naturally occurring, albeit unusual, meteorological phenomena. According to material published by the BLT institute, anomalies found at some circle sites in England and the United States are consistent with them having been created when localized columns of ionized air (dubbed plasma vortices/vortexes) form over standing crops. Minuscule spheres of magnetic iron have also been found, distributed either around the perimeter of the circle, or linearly, which suggests a very complex delivery system. Bent or extended nodes in the stems of cereal grasses too have been found, suggesting that the crop has been subjected to a very rapid electromagnetic burst, causing the moisture inside the stems to expand, stretching or bending the nodes to almost three times their length. Holes have been found in the nodes, suggesting a rapid microwave burst, causing the moisture to turn into steam, which then forces its way out and leaving expulsion cavities. Other hypotheses attribute them to atmospheric phenomena such as freak tornadoes or ball lightning. Of course, these theories do not readily explain the intricate, precise, and geometrical design of many crop circles. The main criticism of theories of non-human creation of crop circles is that evidence of these origins, besides eyewitness testimonies, is scant. Crop circles are usually easily explicable as the result of human pranksters. There have also been cases in which researchers declared crop circles to be "the real thing," only to be confronted soon after with the people who created the circle and documented the fraud. 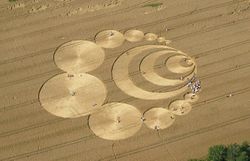 Many people have demonstrated how complex crop circles can be created. 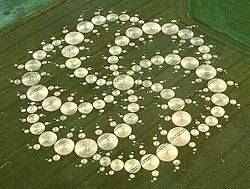 In his 1997 book The Demon-Haunted World: Science as a Candle in the Dark, Carl Sagan discussed alien-based theories of crop circle formation. Sagan concluded that no empirical evidence existed to link UFOs with crop circles. Specifically, he reported that there were no credible cases of UFOs being observed creating a circle, yet there were many cases when it was known that human agents, such as Doug Bower and Dave Chorley, were responsible. In 1999, researcher Colin Andrews received funding from Laurence Rockefeller to conduct a two-year investigation into crop circle hoaxing. Andrews put together a team which studied crop circles and infiltrated several groups known to be creating man-made circles. Using these man-made circles as a base, Andrews went on to study data from circles found in England in 1999 and 2000. Andrews concluded that 80 percent of all circles studied showed "unassailable" signs of having been man-made, including post holes used to demarcate circle layouts or evidence of human tracks underlying the circle sites, but could not account for the remaining 20 percent, for which he was unable to find signs of human interaction. Andrews' figures were disputed by the Committee for Skeptical Inquiry (CSICOP), arguing that Andrews' criteria for distinguishing between man-made circles and non man-made circles were insufficient, since no official standard exists for determining the nature of a crop circle. If crop circles are made by hoaxers, then they should stop doing it, because they are breaking the law and damaging the food supply. If they are made by UFO aliens, they shouldn't give us back the dates of our trips to Mars and the names of the men from the Titanic era - famous, clever, but now forgotten. If some are transcendental, the power behind it should realize that our culture is not now willing to accept transcendental happenings. But if they are indeed transcendental, then society will have to make a big adjustment in the years ahead. Some would argue that crop circles are the greatest mystery of our age. Others dismiss them as the work of pranksters and hoaxers. Some claim that they are a source of enlightenment whilst others are disappointed at the politics they have created. However you view the crop circles, there is no denying that they have had a profound effect on mankind in these latter years of the 20th Century. The crop circles can be viewed as a complete microcosm of human passion and vulnerability. Almost a condensed version of the human race itself, with egos, anger, peace and varying views all expressed by followers. ↑ Anderhub Werner and Hans Peter Roth, Crop Circles: Exploring the Designs & Mysteries (Lark Books, 2002, ISBN 1579902979). ↑ 4.0 4.1 Leslie G. Howarth, If in Doubt, Blame the Aliens! : A new scientific analysis of UFO sightings, alleged alien abductions, animal mutilations and crop circles (iUniverse, 2000, ISBN 0595156932). ↑ Lynne Kelly, The Skeptic's Guide to the Paranormal (Allen & Unwin, 2004, ISBN 1741140595). ↑ John Rand Capron, "A case of genuine crop circles dating from July 1880," Journal of Meteorology 25 (2000): 20-21. ISSN 0307-5966 (original Nature 22 (July 1880): 290-291). ↑ Matt Ridley, "Crop Circle Confession," Scientific American, July, 2002. Retrieved January 21, 2009. ↑ John Macnish, Cropcircle Apocalypse (Circlevision, 1993, ISBN 095225803X). ↑ Robert Carroll, Skeptics Dictionary: Crop Circles (Wiley, 2005, ISBN 0471272426). ↑ Paul Vigay, "Enigma Issue 1: Electro-Static Charge Indications,", Crop Circle Research, 1993. Retrieved January 21, 2009. ↑ Paul Vigay, Crop Circle Research Projects into Sound and Harmonics, Crop Circle Research, 2007. Retrieved January 21, 2009. ↑ 19.0 19.1 Colin Andrews and Stephen J. Spignesi, Crop Circles: Signs of Contact (New Page Books, 2003, ISBN 156414674X). ↑ Eltjo Haselhoff, The Deepening Complexity of Crop Circles: Scientific Research and Urban Legends (Frog Ltd, 2001, ISBN 1583940464). ↑ 22.0 22.1 Carl Sagan, The Demon Haunted World (Ballantine Books, 1997, ISBN 0345409469). ↑ Circlemakers. Retrieved January 21, 2009. ↑ Joe Nickell, "Levengood's Crop-Circle Plant Research," Investigative Files, Skeptical Briefs newsletter, June 1996. Retrieved January 21, 2009. ↑ Freddy Silva, Secrets in the Fields: The Science and Mysticism of Crop Circles (Hampton Roads Publishing Company, 2002, ISBN 1571743227), 299. ↑ Paul Vigay, Crop Circles - What's it all coming to? Enigma Issue 17, Crop Circle Research, 2007. Retrieved January 13, 2009. Crop Circles: Artworks or Alien Signs? – Mayell, Hillary, National Geographic News, August 2, 2002. Scientific Viewpoints regarding Crop Circles, – Meaden, T. CERES, February 2000. Crop Circles – Solodovnik, Nataliya Anatolievna. This page was last modified on 25 November 2017, at 16:56.